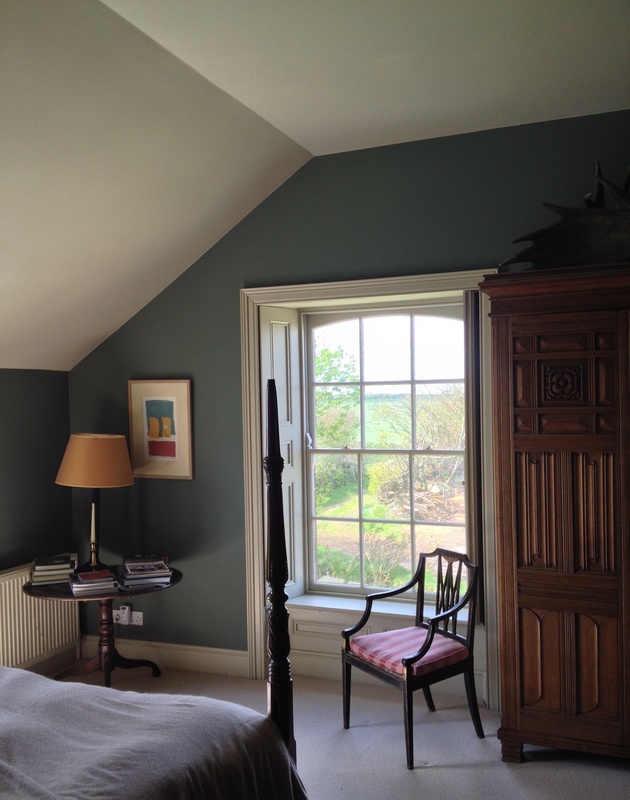 A coved ceiling at Somerville, County Meath. 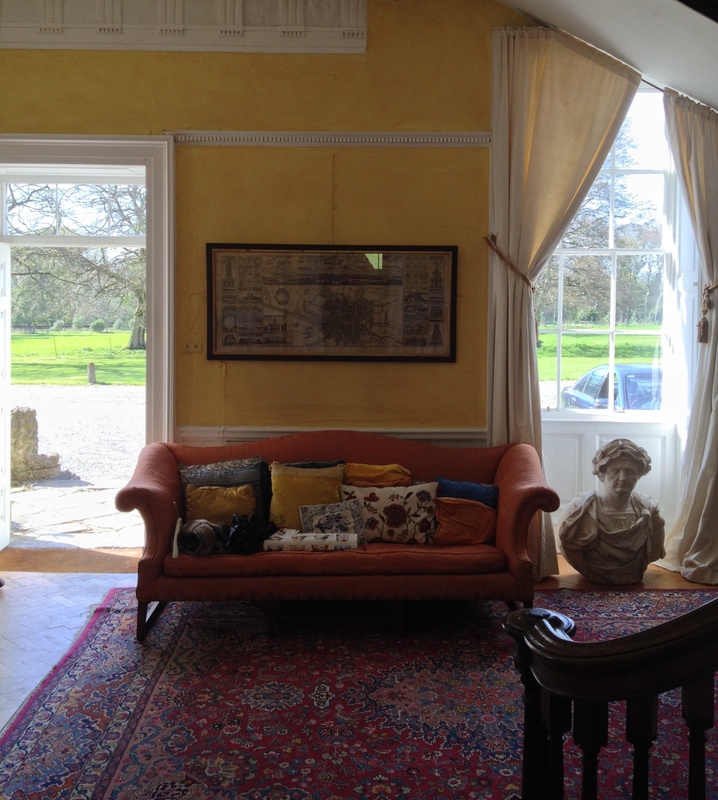 As has already been mentioned (see Rise Above It All, April 19th), the house dates from c.1730 but underwent considerable alteration about 100 years later when the entrance was moved from south to north front and a new hall created. Although the room containing this ceiling is now classified as the dining room, an examination of its decoration, which certainly looks to be pre-19th century, reveals clusters of musical instruments in each of the four corners. Might it therefore originally have been intended to serve as a ballroom? 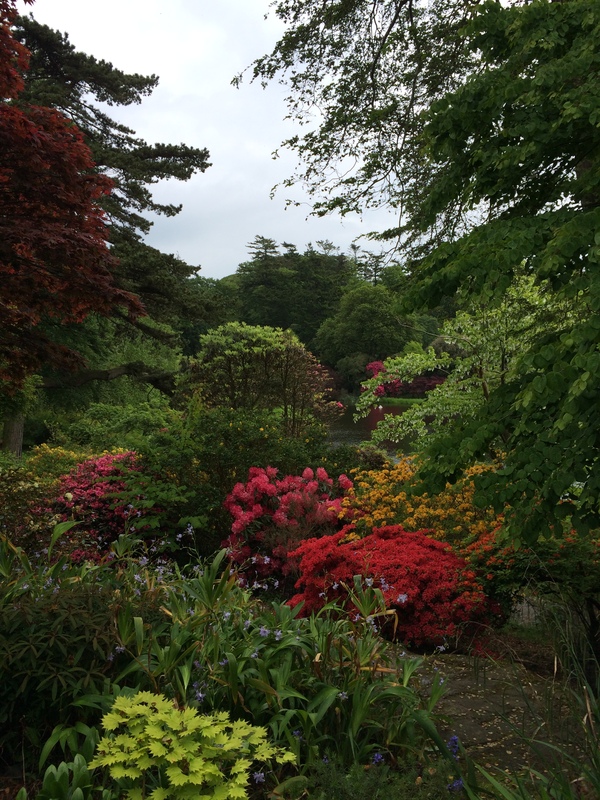 Through dense planting, a glimpse of the lake at Mount Stewart, County Down. 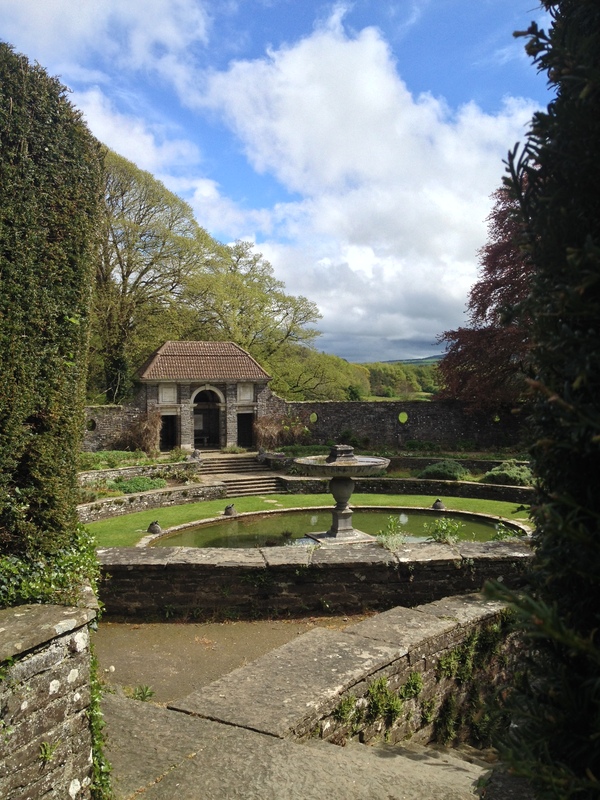 The gardens around the house, created from the mid-1920s onwards by Edith, seventh Marchioness of Londonderry, are justly famous but the attention they attract can mean the rest of the estate receives less attention. This part of the demesne dates from the first half of the 19th century, following the marriage of the third Marquess to the great heiress Frances Anne Vane-Tempest: her wealth allowed the creation of the lake to the north of the house on the site of a former gravel pit, and extensive planting around its borders. 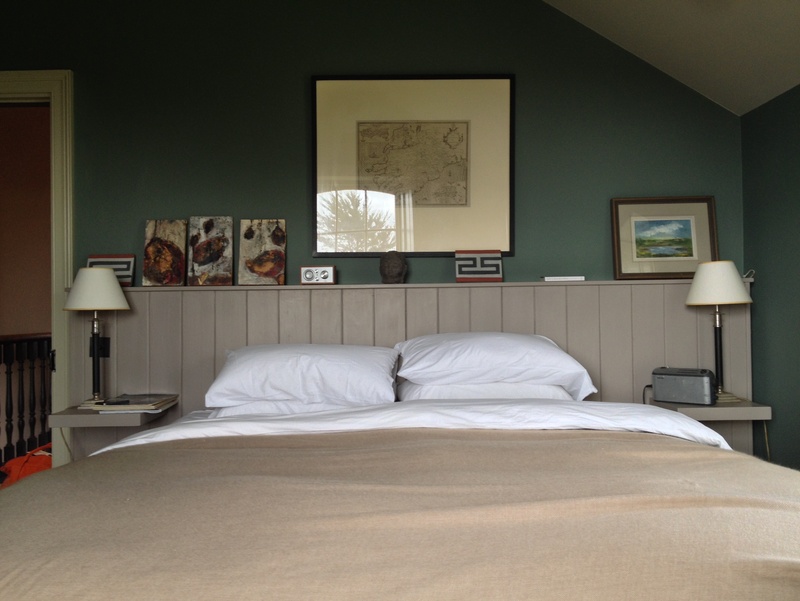 The settled nature of County Kildare, the fertile quality of its land and proximity to Dublin, all have long combined to give this part of the country a peacefulness and prosperity not always found elsewhere in Ireland. 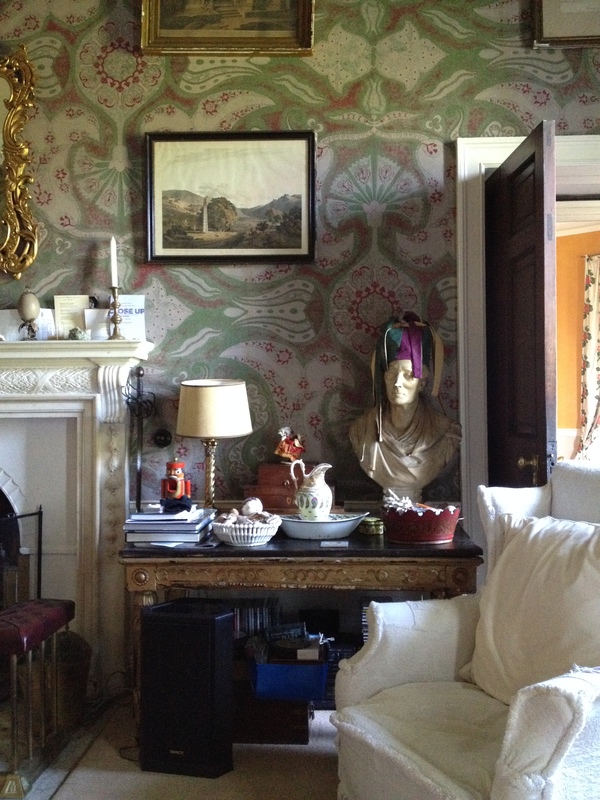 These qualities are evident at Furness, a property which, unusually, has changed ownership on only a handful of occasions over the past eight hundred years. On a hill behind the present house stands a longstone rath, an earth ring some 200 feet in diameter with a fourteen foot granite standing stone in the centre: created around 4,000 years ago, it testifies to how long there has been human settlement here. Of more recent vintage are the nearby remains of an old church (a nave and a chancel separated by an arch) built on the site of an earlier religious establishment. In 1210 this church was granted with tithes to the Regular Canons of St Augustine based in the Abbey of St Thomas, Dublin who were considerable landowners in the neighbourhood. They remained in occupation for over three centuries until the advent of the Reformation in the 1530s saw the acquisition of such properties by lay owners. In this instance, the Augustinians were replaced by the Ashes, a mercantile family from nearby Naas who were kinsmen and friends of the powerful Eustace clan. Then, most likely in the 1670s, Furness passed into the hands of the Nevilles (sometimes spelled without the ‘e’). The Nevilles are believed to be an Anglo-Norman family settled in County Wexford. The first of their number known to be resident at Furness was Richard Neville, listed as Sheriff of County Kildare in 1678. More than twenty years before, he had married Margaret, daughter of Sir William Ussher (the man responsible for the publication of the first New Testament translated into Irish): curiously this family, which is remembered by the Usher’s Quay and Usher’s Island in Dublin, is supposed originally to have been called Neville but their forebear on coming to Ireland in 1185 as usher to King John changed his name to that of his office. In any case, the next generation, also called Richard Neville was Sheriff of Kildare in 1692, and Sovereign of Naas (that is to say, the town’s mayor) in the same year. He subsequently became Recorder of Naas and its Member of Parliament in 1695, and again in 1708. On his death in 1720, the estate passed to a third Richard Neville, a captain in the army who never married and probably therefore had the wherewithal to embark on the building of a new residence, the three-bay block at the centre of the present house. On his death, Furness passed to a nephew, Arthur Jones whose mother Mary had married Richard Edward Jones, colonel of the regiment in which his brother-in-law served. Even before coming into his inheritance, young Arthur had the good sense to change his surname to Neville. Arthur Jones Neville had a colourful career. Born c.1712, by 1742 he was a member of the Dublin Society and the following year he was appointed Surveyor General, having purchased the office for £3,300 from its previous holder Arthur Dobbs; during his time in the position he was responsible, amongst other work, for drawing up the plans for barracks at Charles Fort in County Cork and for developing the Bedford Tower range at Dublin Castle. In 1748 he succeeded in having his salary increased and three years later entered the Irish House of Commons as MP for County Wexford. However, his troubles then began and in August 1752 he was dismissed as Surveyor General on the grounds of maladministration in relation to barrack building (he was, however, permitted to sell it on to the next holder). Then in 1753 during what is believed to have been a politically-motivated campaign of vilification he was expelled from the House of Commons. While this setback caused a stir at the time it does not seem to have done him permanent damage, since he returned to represent the same constituency in 1761 (and continued to do so until his death a decade later), and became Sheriff of County Kildare in 1762. 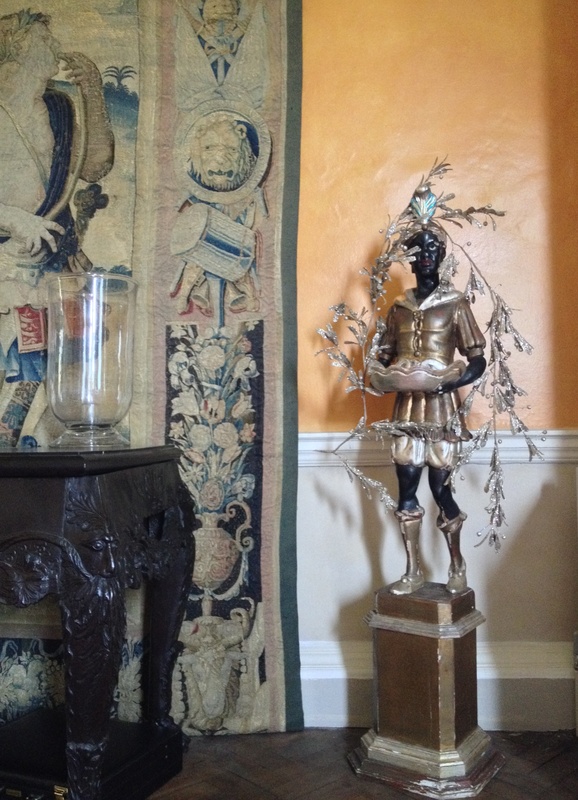 From our perspective, and much more importantly, Arthur Jones Neville seems to have been a man of exceptional taste and discernment, even during a period when – unlike our own era – such characters were found in abundance in Ireland. 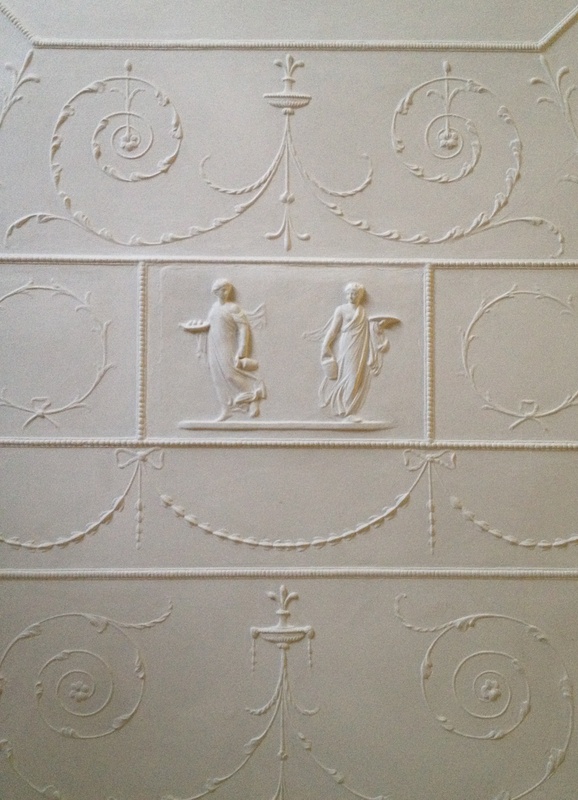 For a house he built at 40 St Stephen’s Green, Dublin in 1746, he commissioned the elaborate Apollo ceiling (by an unknown stuccadore): at the time of the building’s demolition, this was rescued and is now, appropriately enough, in the State Apartments of Dublin Castle. Similarly the following decade when he embarked on another building project at 14 Rutland (now Parnell) Square, he commissioned painted lunettes after Pietro da Cortona’s decorations in the Palazzo Pitti, Florence from Jacob Ennis who he had sent to Italy. 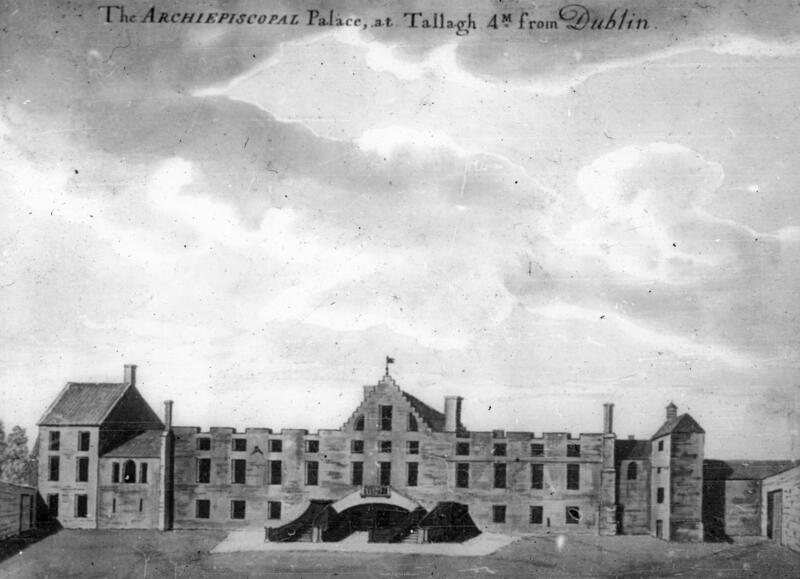 A subscriber to several volumes on architecture and surveying, during his second period in parliament, he introduced a number of excellent bills, including proposals ‘For the further encouragement of planting timber trees’ (1765) and ‘For the better regulating of buildings in the city of Dublin, the liberties and suburbs thereof’ (1769). On his death, Arthur Jones Neville was succeeded by his eldest son, once more named Richard Neville. He too became a Member of Parliament for Wexford, holding this position with intervals even after the Act of Union until 1819. He was also Teller of the Exchequer under the Irish Parliament, described as ‘a remarkably pleasant office to hold’ not least because it came with an annual salary of £2,835’ of which £835 went to a deputy who did all the work, leaving the balance to the office holder: he appears to have retained this sinecure until his death in 1822. He is judged to have been an improving landowner, based on an account of Furness given in Arthur Young’s A Tour in Ireland. Young visited the estate in 1777 and afterwards described his host as being ‘a landlord remarkably attentive to the encouragement of his tenantry,’ paying half the cost of houses built on his land, and providing premiums to encourage planting. Richard Neville left two daughters, Henrietta and Marianne dividing his property equally between the two although ‘Furnace, house, offices, garden, front lawn, and back lawn to the river, cottage, and thirty acres’ were bequeathed to Marianne, with an option to take over the demesne at a valuation. Soon the place was sold to another family, the Beaumans who remained there until they in 1895 when they in turn sold Furness to Nicholas Synnott whose wife Barbara was a granddaughter of the seventh Viscount Netterville of Dowth Hall, County Meath(for more on this house, see Netterville! Netterville! Where Have You Been?, December 24th 2012). The Synotts continued to live at Furness until the late 1980s. 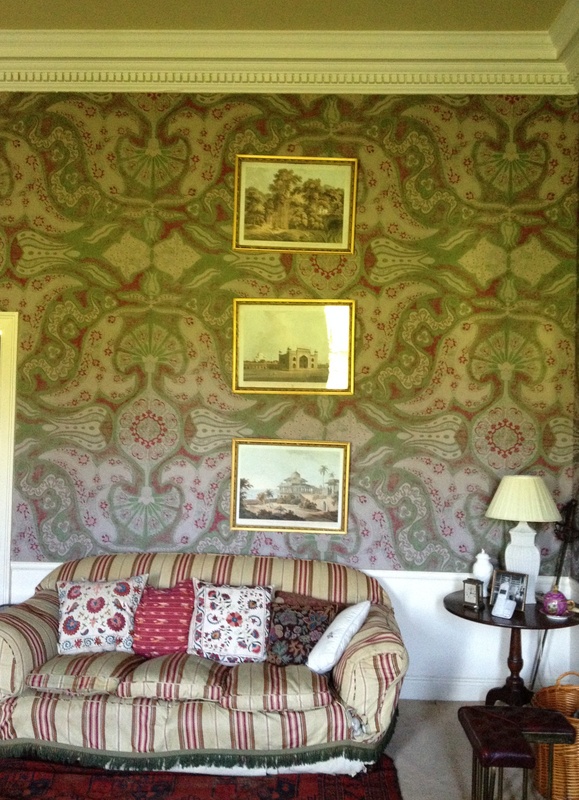 As the photographs above show, Furness has undergone gentle evolution since the original house was built, probably in the early 1730s. 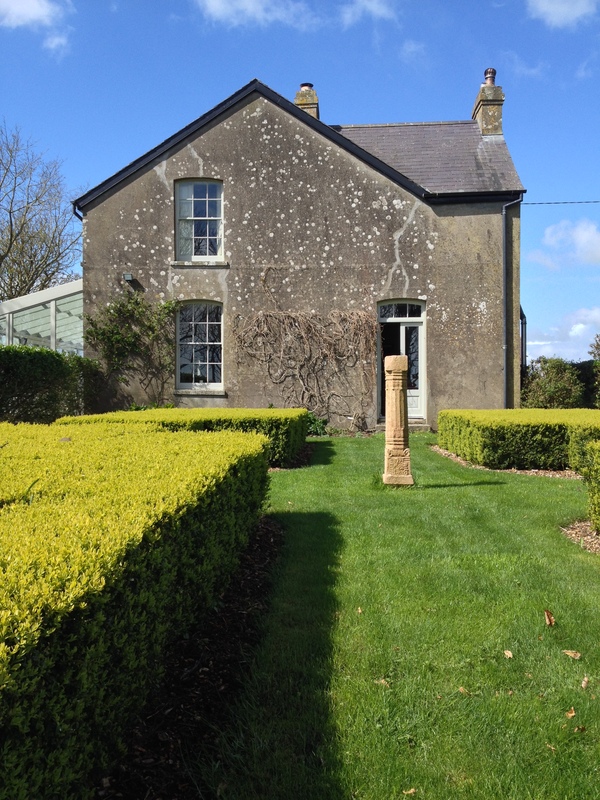 The Knight of Glin attributed the building to Francis Bindon, a name that has occurred here on many previous occasions, not least because it is difficult to say with certainty what was and was not from his hand. The ashlar-faced central block is actually quite small, and one wonders whether it was intended to be larger. Of three bays and three storeys, it has a lunette window above a pedimented first-floor window flanked by Ionic columns, beneath which is the entrance with coupled Doric columns with a Doric entablature. 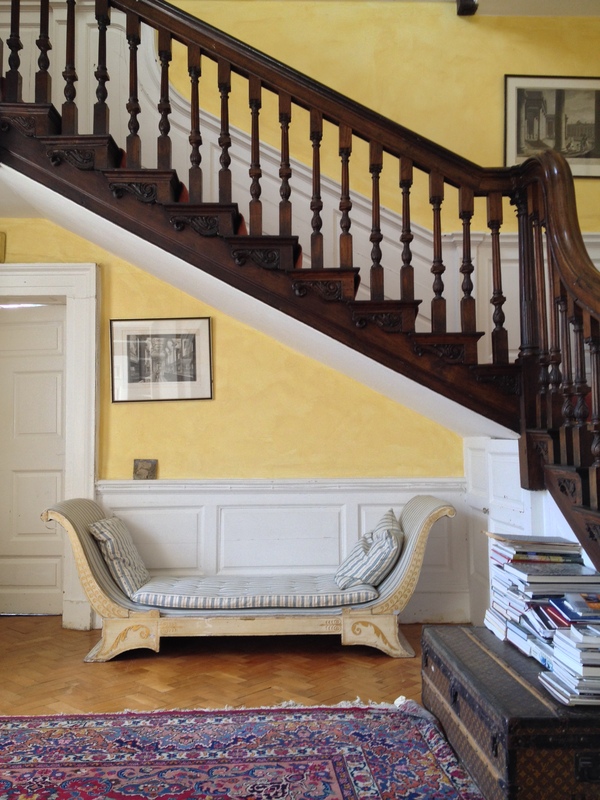 Behind this originally were the entrance hall, still with its handsome staircase of Spanish chestnut, and a study, with a number of reception rooms beyond. Were the wings of the same date or added later? 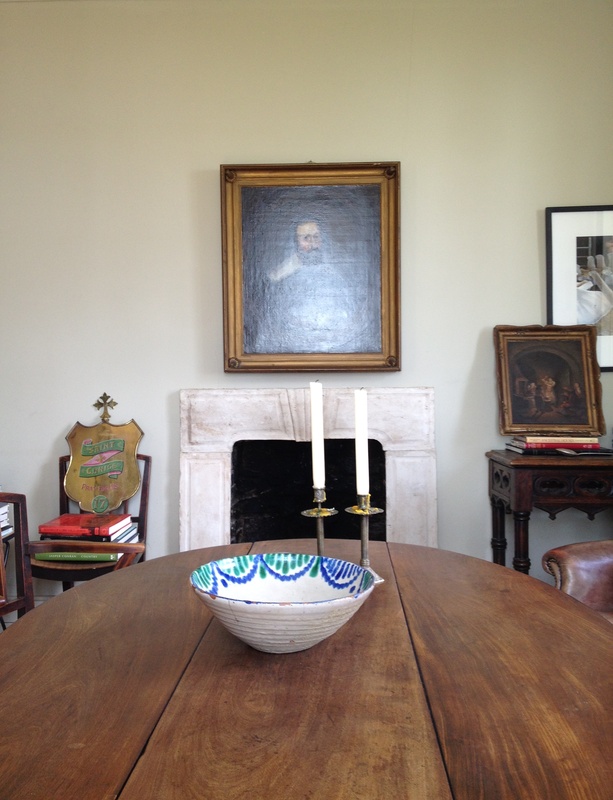 In the 1780s the Nevilles certainly enlarged the house and soon after added a dining room with a large bow. 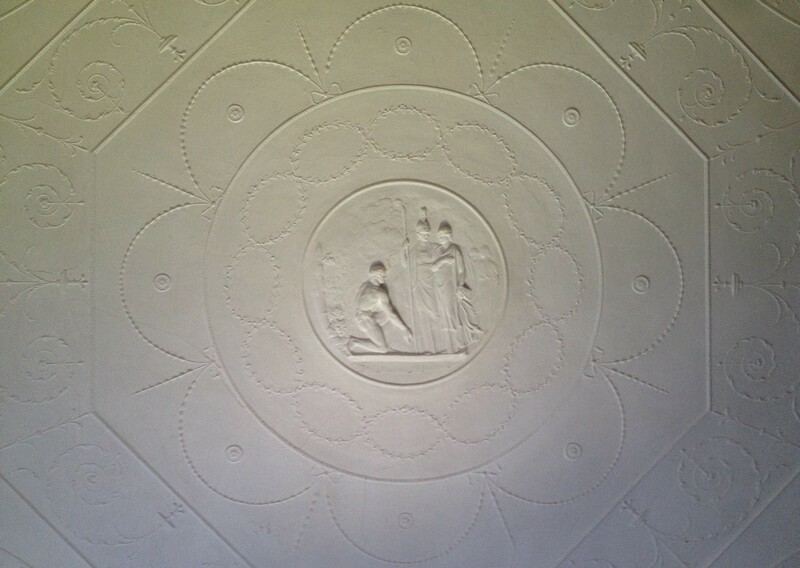 It must have been during this period of expansion that the drawing room ceiling received its neo-classical plasterwork, attributed to Michael Stapleton, the central panel depicting a goddess showing the Greeks how to cultivate olive trees (which would harmonise with Richard Neville’s reputation as an improving landlord), as well as the fine white and Siena marble chimney piece. 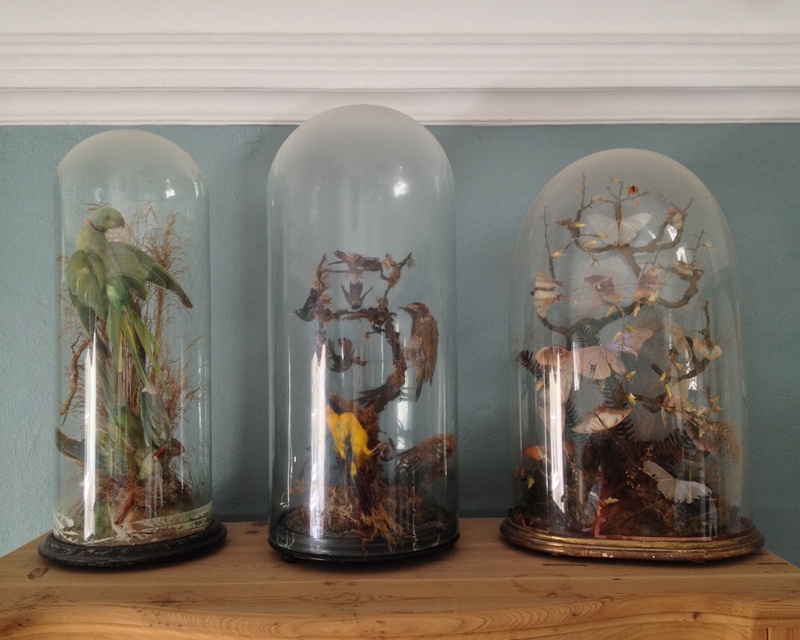 Presumably limited funds meant further such decoration was not possible elsewhere in the house. 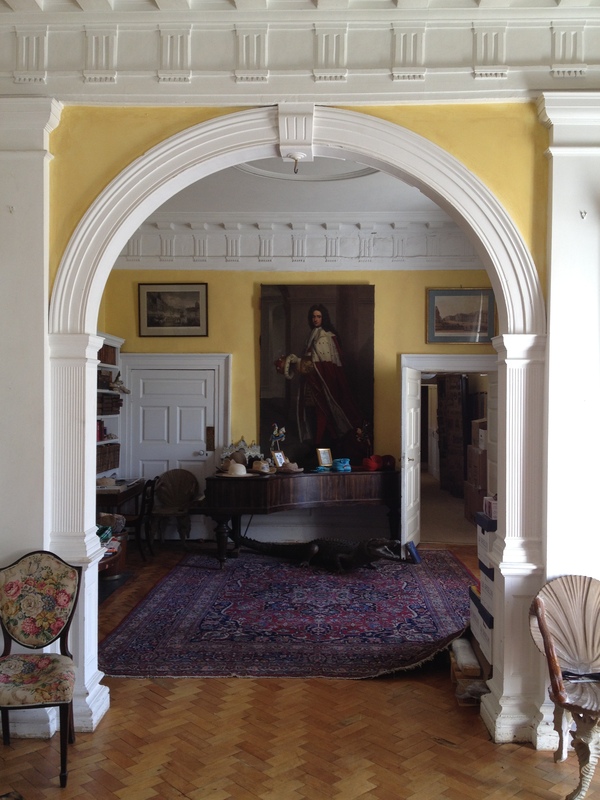 The next major change came after the estate was acquired by the Synotts when the entrance hall was enlarged by breaking a large arch through into the former study. 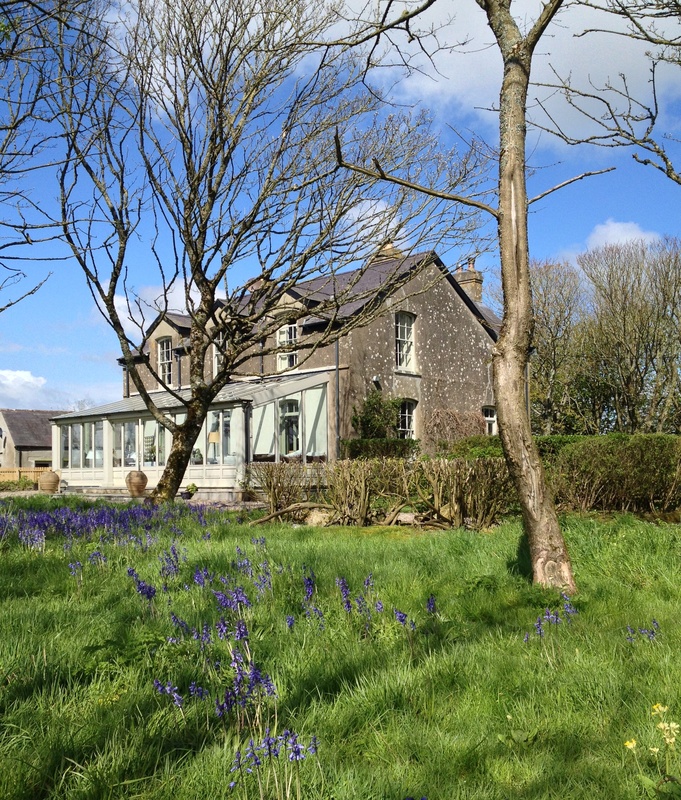 Furness has been owned by the same family for more than twenty years but now they have decided to put the house on the market, for only the third time in 280 years. It is a moment of change but, given the peacefulness and prosperity of County Kildare, one trusts Furness will continue to benefit from the same sympathy and love it has hotherto received throughout its history. 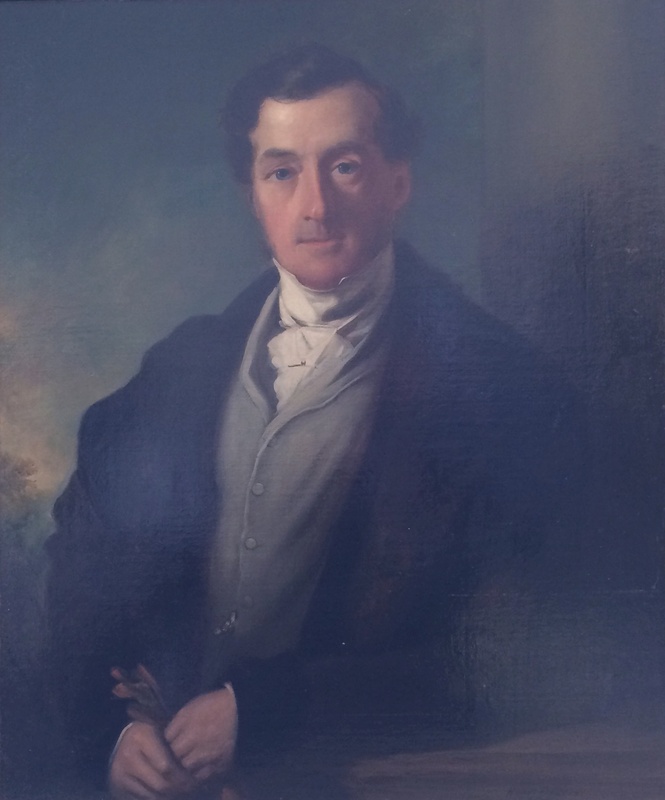 Here is a portrait of Richard Boyle, fourth Earl of Shannon painted by a relatively little-known mid-19th century artist, the Hon Henry Richard Graves. Prior to inheriting his title, Boyle sat in the House of Commons representing County Cork. However, in the aftermath of the 1832 Reform Act with its attendant increase in the size of the electorate, he lost his seat, one of those returned in his place being Garret Standish Barry, the first Roman Catholic to enter Parliament since the Catholic Relief Act three years earlier. 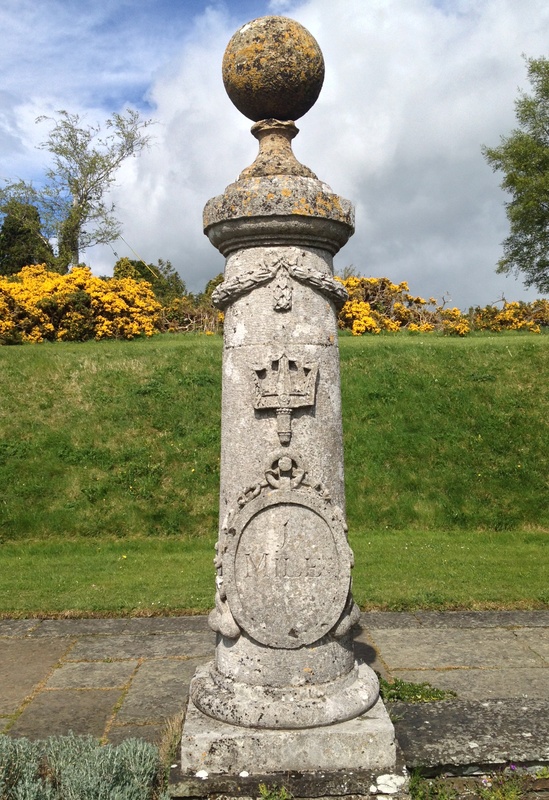 Once notable landowners in East Cork where they owned the Castlemartyr estate, the Earls of Shannon are a branch of the Boyle dynasty established in Ireland by Richard Boyle, the great Earl of Cork. Until the fourth Earl’s unseating, they had enjoyed an active association with this country’s politics: the first Lord Shannon Henry Boyle served as Speaker of the Irish House of Commons for more than two decades before being raised to the peerage in 1756. More than 170 years after Kohl made his observations, they remain pertinent: Ireland continues to be a country of ruins, many of them of recent vintage. Indeed in the last decade we have acquired a fresh crop, so to speak, of ruins thanks to the advent of ‘ghost estates’, those ill-planned, ill-sited and incomplete spatterings of houses begun during the badly-managed economic boom and then abandoned at the onset of the downturn. They join the throng of architectural decrepitude which has been so noted by visitors to Ireland over hundreds of years and yet seems to pass unnoticed by the indigenous population. What is especially noticeable is the gratuitous abandonment of buildings for no apparent reason other than the fallacious notion that they have ceased to be fit for purpose. This is especially true of the country’s older domestic dwellings, ripe for adaptation to contemporary use but instead deserted in favour of something newer – something which will in turn no doubt suffer the same fate. Hence throughout the countryside one comes across a superabundance of farmhouses which with just a modicum of inventiveness and panache could be given a fresh leases of life as an alternative to their more common fate, which is to moulder into ruin. 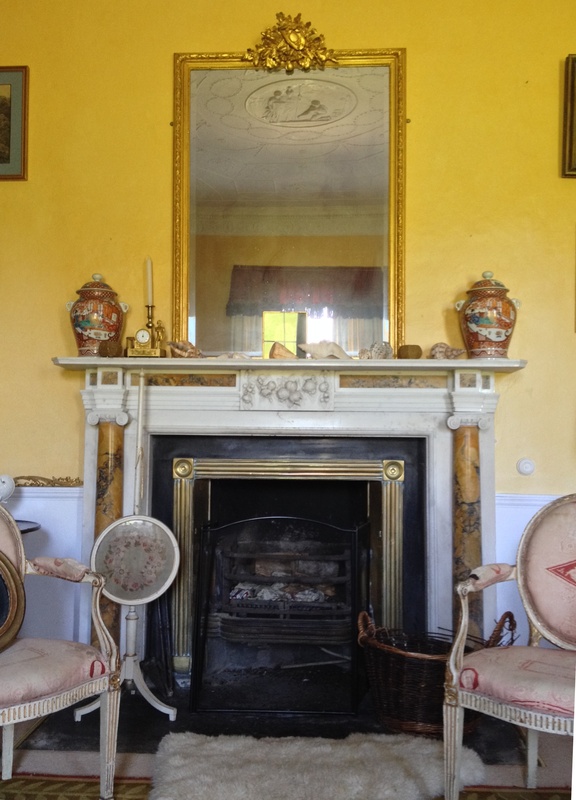 Whatever furniture it once contained had long since disappeared by the time the house was rescued and restored. Unoccupied for more than half a century since the death of a previous owner, its isolation seems to have discouraged anybody else from settling there. 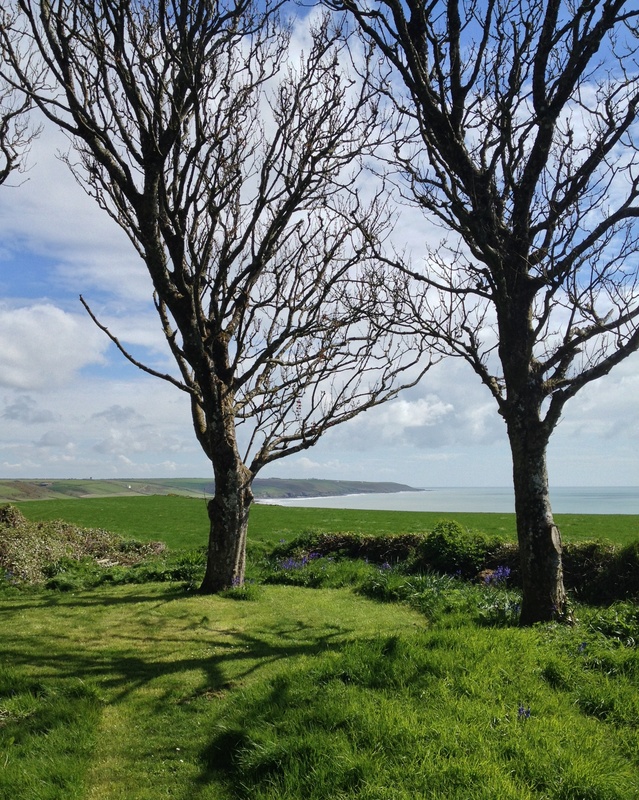 Today that remoteness gives the place romantic appeal, as do the surrounding vistas of rolling fields on three sides of the property, the fourth offering an uninterrupted view of the Irish Sea several hundred feet below: during the summer months, the owner has been known to descend to the shore for a swim. Aside from inaccessibility, another reason why the building would not have won widespread favour is its understated design: unlike smaller and more overtly endearing thatched cottages, the average Irish farm house was never known for superfluous embellishment. Indeed this particular example possesses an unpretentious simplicity typical of the genus. It rightly celebrates the virtues of clean, unfussy composition. But before these could be celebrated an extensive programme of refurbishment was called for because at the time of purchase the building was close to collapse. 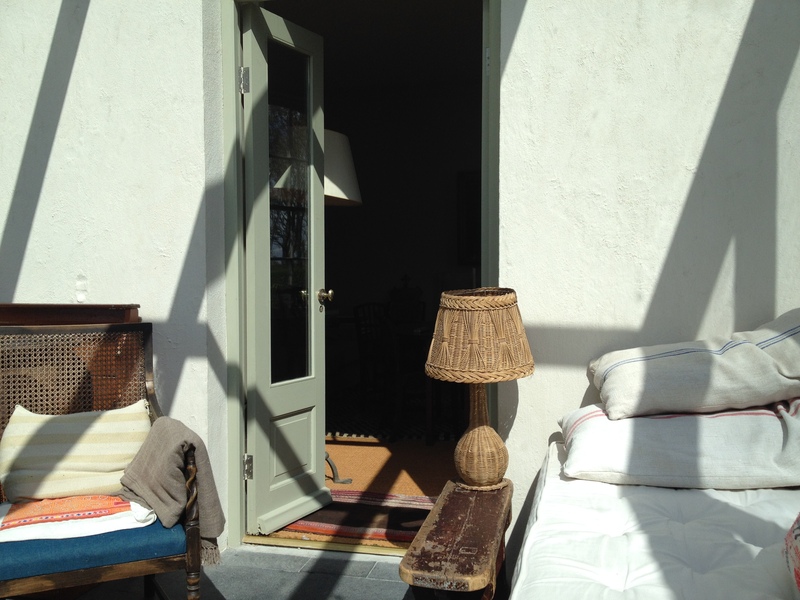 The roof demanded immediate attention, as did walls, doors and windows. 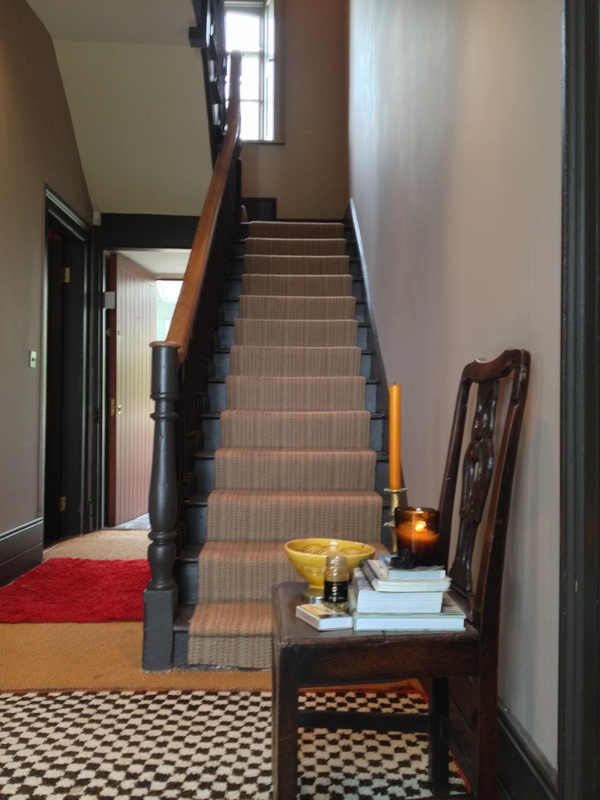 Internally the main feature to be salvaged was the old staircase although even here sections required repair and replacement. 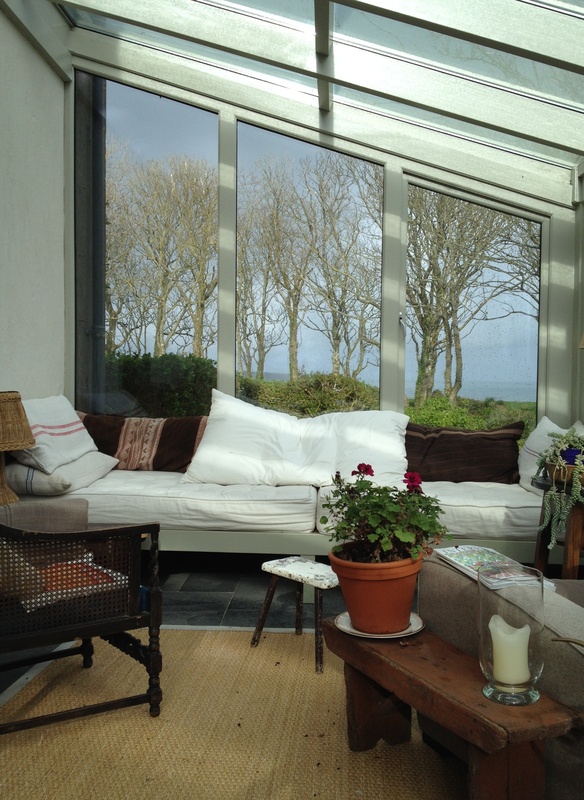 While this was going on, changes were made to the south, sea-facing front with the three existing windows lowered to create a trio of double doors opening onto a terrace flagged with limestone. 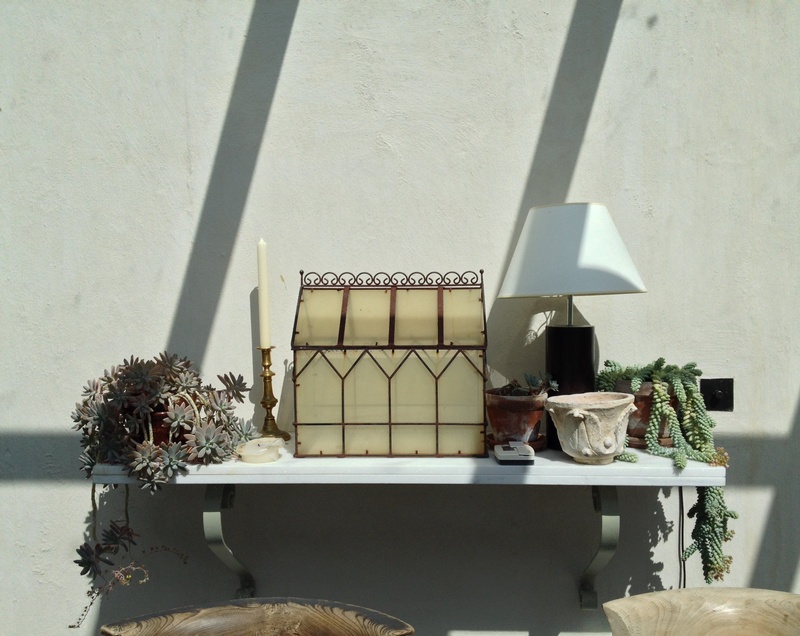 More recently the terrace has been enclosed by a full-length conservatory that now serves as sitting room, dining room and, as we Irish like to say, whatever you’re having yourself. In addition the first floor plate-glass windows were changed to double sashes with glazing bars, a modification which immediately softened the house’s unadorned exterior. As was the custom with such properties, the walls are cement-rendered and then left without even a lime wash but weathered by time and exposure to the elements. 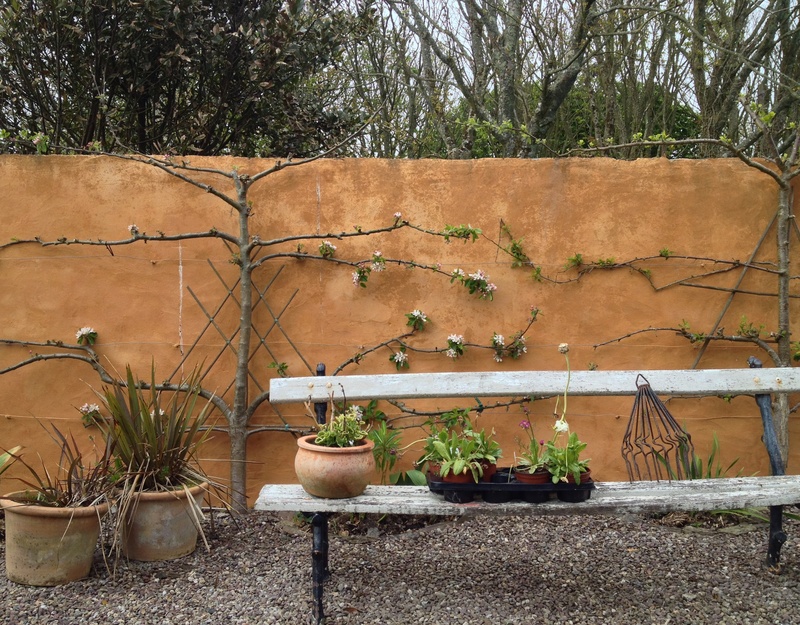 Several out-buildings have also been restored, a vegetable garden created and a secure area for hens and geese devised. Otherwise the rest of the 20 acres acquired by the owner has been left in its familiar state of fields interspersed with copses of trees. The same low-key approach has been adopted inside the house. 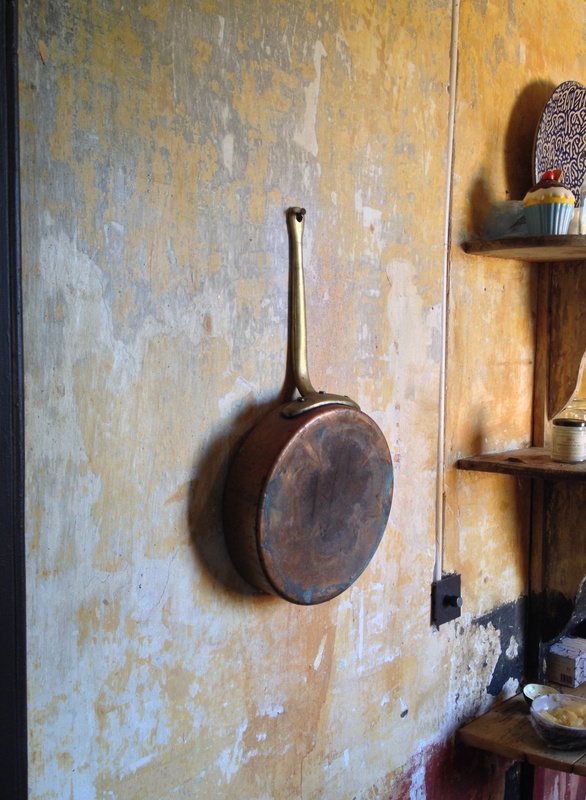 The kitchen, for example, retains its original tiled floor and as much of the old ochre wall colouring as could be preserved; new cupboards have been sympathetically painted to harmonise with what was already in situ. 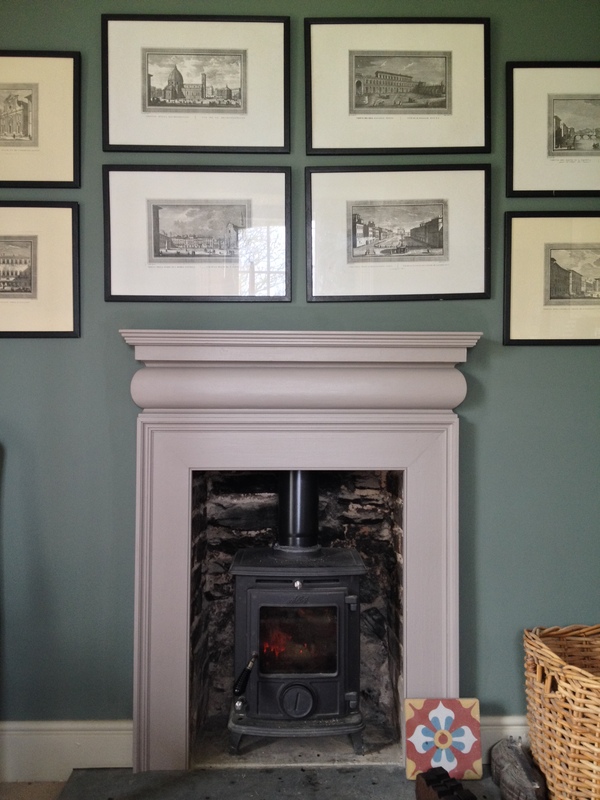 The diningroom opposite is equally understated, with clay plaster used to cover the walls, an old oven used as open fireplace and the furnishings of plain pine. 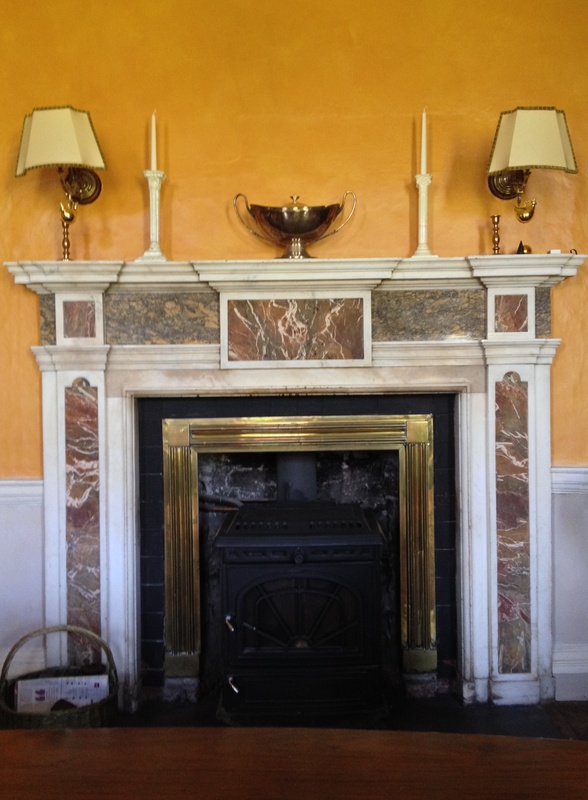 A slightly more elaborate approach was taken to the decoration of the two reception rooms to the front of the house – the chimneypieces here are clearly not original – but they share the same comfortable, unassuming character found throughout the building. Chairs, tables and other items of furniture have been picked up over a period of time and during the course of extensive travels, none of them for great price. Most of the pictures were acquired in the same way or were painted by friends. The result offers a model of how to convert an old farmhouse into a comfortable, smart private residence. In every county throughout Ireland, there are many similar properties sliding into what looks like inexorable decay and thus adding to our already ample list of ruins. Were Johann Georg Kohl to visit our island today, he would find little had changed since the last time he was here – except in this little corner of the country. 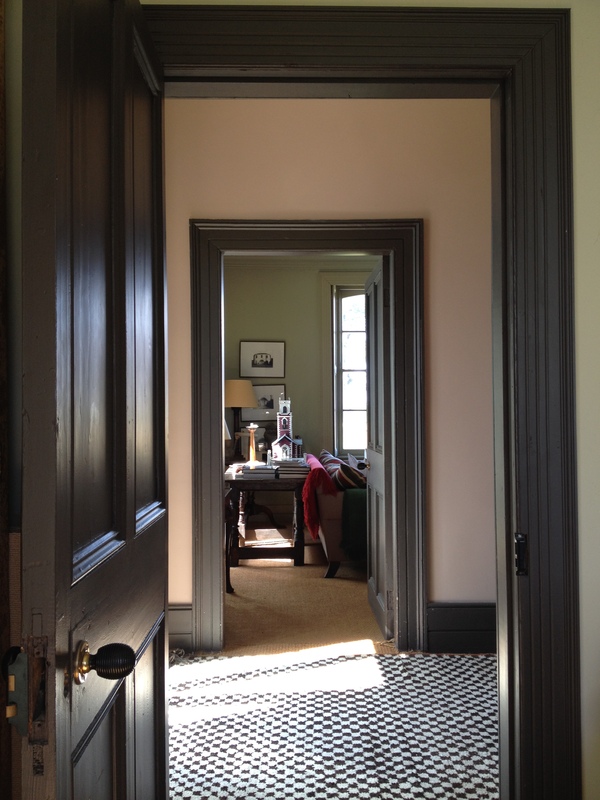 Here, for once, a house has been saved from ruin and its character improved rather than destroyed in the process. 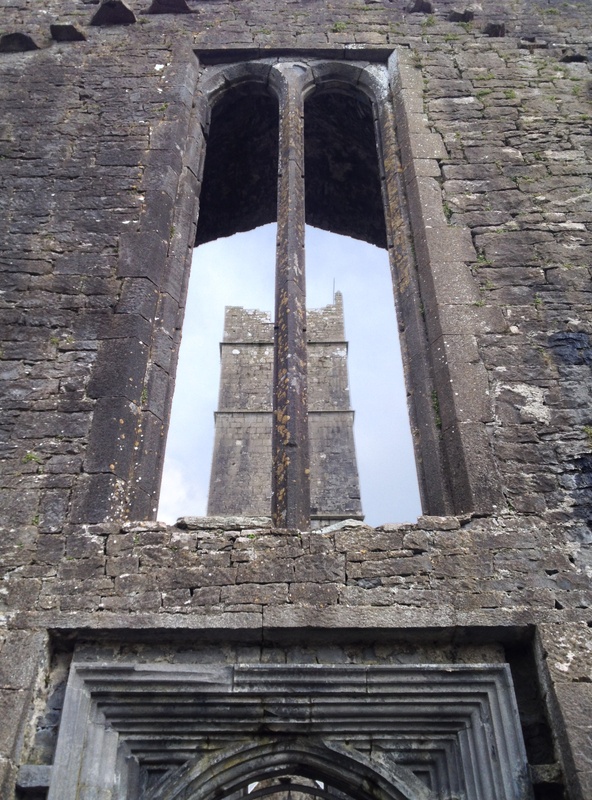 The tower of the church at Quin Friary, County Clare seen through one of its transept windows. Another of the outstanding Franciscan houses in Ireland, Quin Friary was established in the mid-14th century by members of the local MacNamara family. However, it was built on the site, and incorporated parts, of a castle built in 1280 by the Norman Richard de Clare in an unsuccessful attempt to subdue the same family: six years later this structure was attacked and burnt by Cuvea MacNamara who slaughtered most of its occupants. The subsequent friary had an equally bloody and incendiary history. In 1584, for example, Donough Beg O’Brian, having been half-hanged from a cart and his bones broken with the back of an axe was strung up while still alive from this same tower by Sir John Perrot; a few years later the building was again set alight by another of the O’Brians. Somehow, and with intermittent breaks, Franciscan friars continued to live on the site, the last resident only dying in 1820. Today there is little evidence of the friary’s turbulent past. Travellers in Ireland during the 18th and 19th centuries seem rarely to have visited Laois, or Queen’s County as it was known until 1922. The preference was to head either south or north or west, by-passing the midlands with the result that references to this part of the country are not so easy to find. 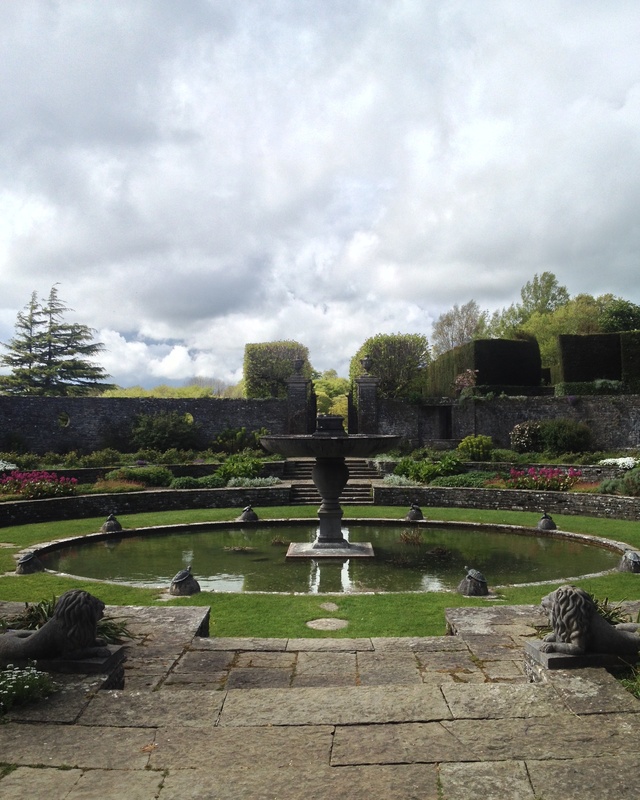 One suspects this continues to be the case, a pity since land-locked Laois has much to offer, not least the Lutyens-designed gardens at Heywood. The main outlines of the estate here were created by Michael Frederick Trench, son of the Rev. Frederick Trench; one of those visitors to Ireland who did explore the area, English antiquary Owen Brereton, in 1763 wrote of the cleric’s property, describing it as ‘a sweet Habitation’ with ’24 Acres Walld round 10 feet high.’ Both the habitation and the grounds were enlarged by his son who in 1773 built a new house which he named Heywood after his mother-in-law’s maiden name. 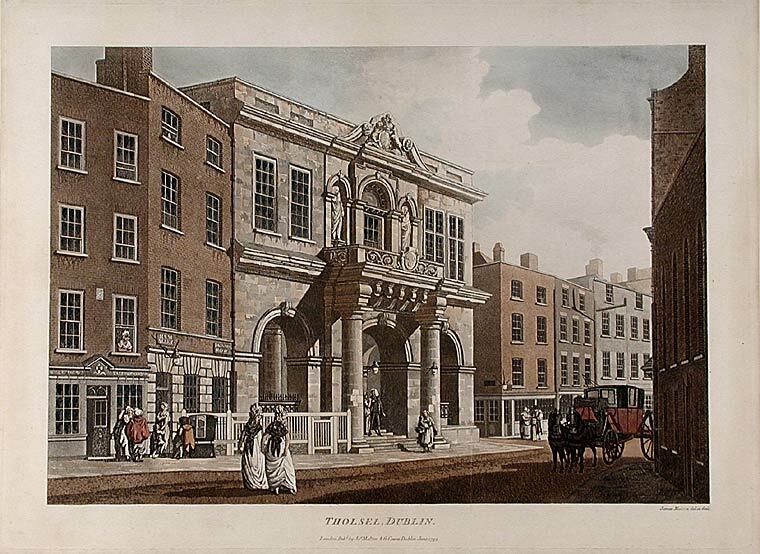 A barrister and amateur architect, Trench is believed to have been responsible for the building’s design, perhaps in consultation with James Gandon: Thomas J Mulvany’s biography of the latter (published 1846) states that in 1785 Trench ‘anxiously superintended’ the erection of the Rotunda Assembly Rooms in Dublin, being a member of the building committee. He has also been credited with the design of the two pavilions which terminated the colonnades on either side of the lying-in hospital. Sons of a Queen’s County barrister, both men were educated at Dr Burney’s Academy in Gosport, near Portsmouth before joining the navy. Edmund rose to be promoted to Rear-Admiral in 1902, second in command of the Home Fleet the following year and Commander of the 1st Cruiser Squadron in 1904. A year later he was appointed Commander-in-Chief, East Indies Station, then Commander-in-Chief, Cape of Good Hope Station in 1907 and Commander-in-Chief, Mediterranean Fleet in 1910. Finally he became First and Principal Aide-de-Camp to George V in 1912, retiring two years afterwards. William Hutcheson Poë meanwhile served in the Royal Marines and from 1884 was in Sudan, commanding a unit of the Camel Corps in the Relief of Khartoum in 1885 during which period he had a leg amputated. The following year he married Mary Adelaide Domvile and retired from service in 1888 when promoted to Lieutenant Colonel. The rest of his public life can be summarised as follows: in 1891 became High Sheriff for Queen’s County, and in 1893 for County Tyrone. He was a member of the Land Conference in 1904, was appointed a Governor of the National Gallery of Ireland in 1904 and created a baronet eight years later. In 1915 to 1916 he served in Egypt in the First World War, and from 1916 to 1919 with the Red Cross in France. From 1922 to 1925 he served as a Senator of the Irish Free State. In the 1890s this building was enlarged and almost engulfed by extensions to either side, designed by one of the period’s most indefatigable architects Sir Thomas Drew. Sadleir and Dickinson’s 1915 Georgian Mansions of Ireland describes the result as ‘a large building, embodying extensive recent additions, and has been in fact so completely re-edified that one room only retains its entire Georgian character. 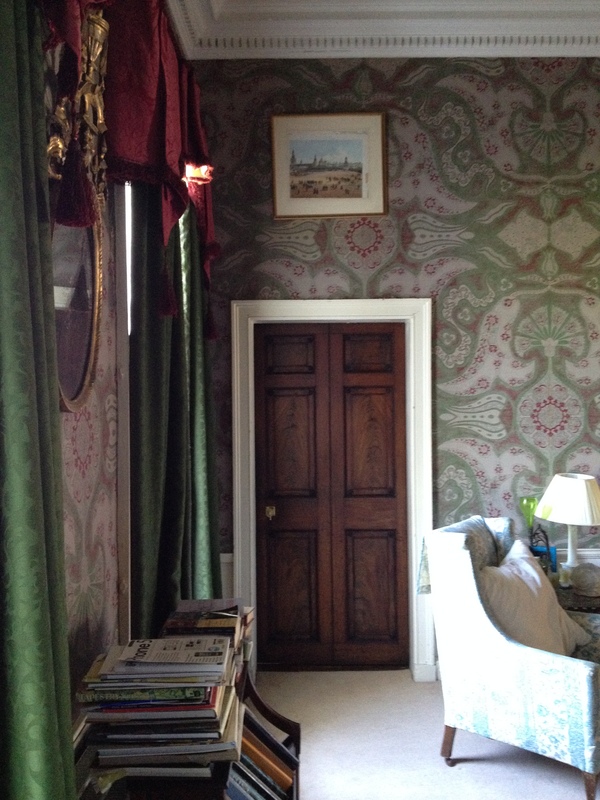 This is the large and well proportioned dining-room, a singularly handsome apartment, and one of the finest examples of the Adam style in this country…the walls are covered with plaster panels and festoons, which, like the ornament of the over-doors, are very delicately modelled. 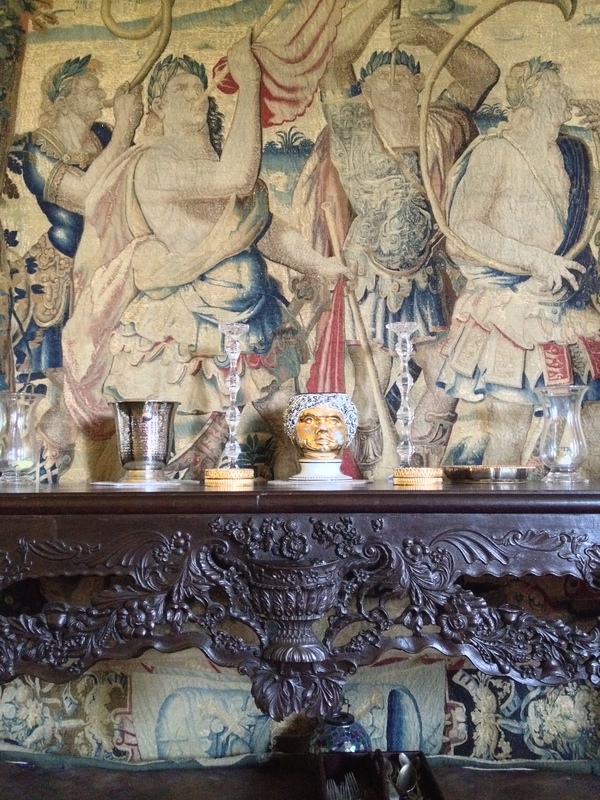 The mantel, purchased by the present owner in London, exhibits Adam decoration with wedgwood plaques, and there is a steel grate…A series of Minerva heads in the frieze conceal the electric light bulbs, this ingenious device obviating the introduction of unsightly electroliers. In the adjoining drawing-room, which also retains some Georgian features, are a number of valuable pictures, including the fine full-length of John Musters, of Colwick, in Nottinghamshire, by Sir Joshua Reynolds…’ A series of photographs taken by A.E. Henson in 1917 and published in Country Life two years later testify to Colonel Hutcheson Poë’s discerning taste as a collector of pictures and furniture, even if not of architecture. 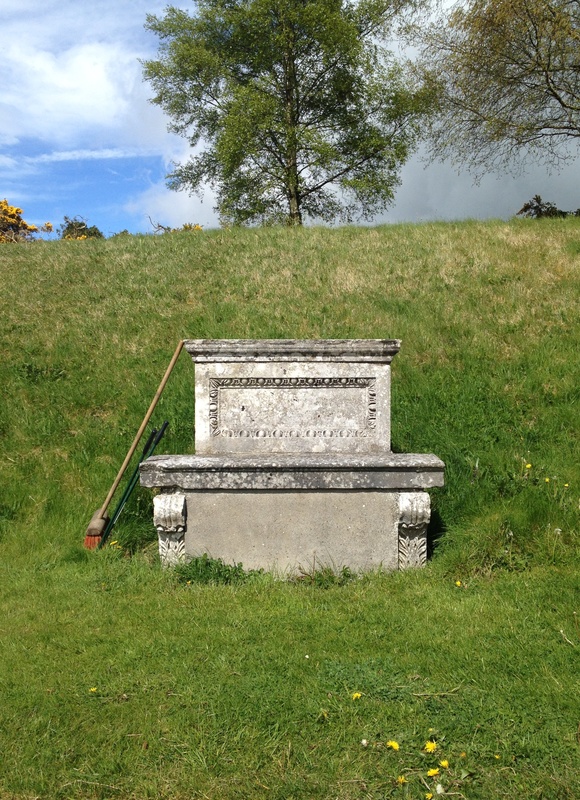 Outside also Colonel Hutcheson Poë set about leaving his mark. The house at Heywood was built at the top of a south-west facing ridge from which the ground drops steeply to a lake out of which runs a stream in turn feeding two further lakes. As well as being a successful army man, Sir Frederick William Trench was a talented artist (just as his father was an amateur architect), and in 1818 he produced several drawings of the demesne from which lithographs were produced; these give an excellent idea of how the view swept away from the house across water and trees towards distant mountains, the very incarnation of the romantic landscape. 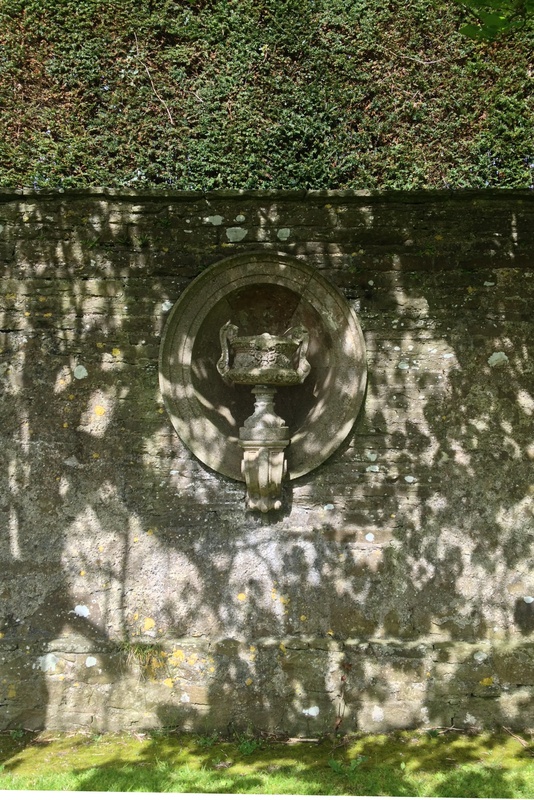 Nevertheless in 1906 Hutcheson Poë commissioned Edwin Lutyens to come up with a design for gardens in the vicinity of the house, occupying the area to the immediate south, east and west. 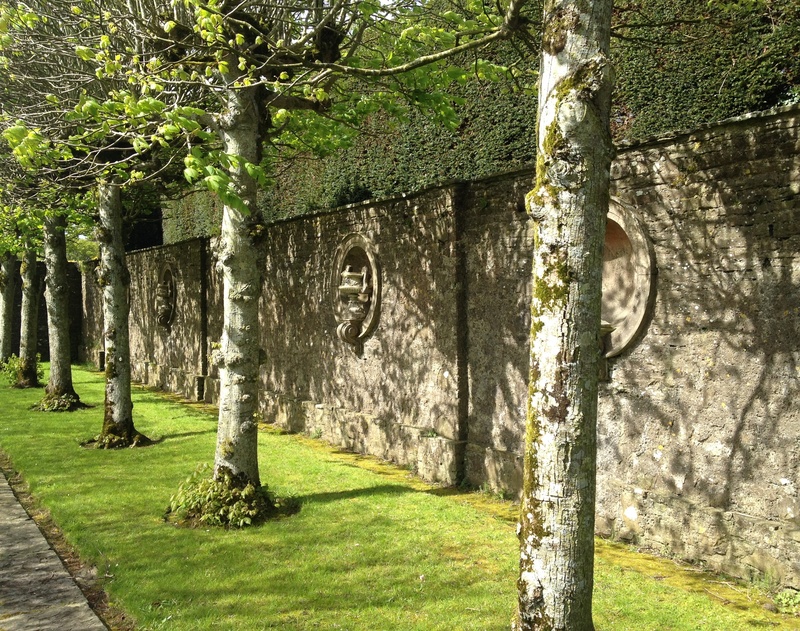 As has already been explained, this part of the parkland is on a slope, and so the first and most important task was to build a massice retaining wall with buttressing to protect the house above from any risk of slippage. Thereafter the main features of the scheme begin with a pair of central terraces relatively uncluttered so as not to obscure views from the building; other than flagged walks and grass lawns, the most notable feature here is a pair of columns topped with stone balls and carrying carved milestones. Presumably Lutyens recycled these from elsewhere, as he did a series of Ionic columns which were once part of a Temple of the Winds erected by Michael Frederick Trench elsewhere in the grounds. 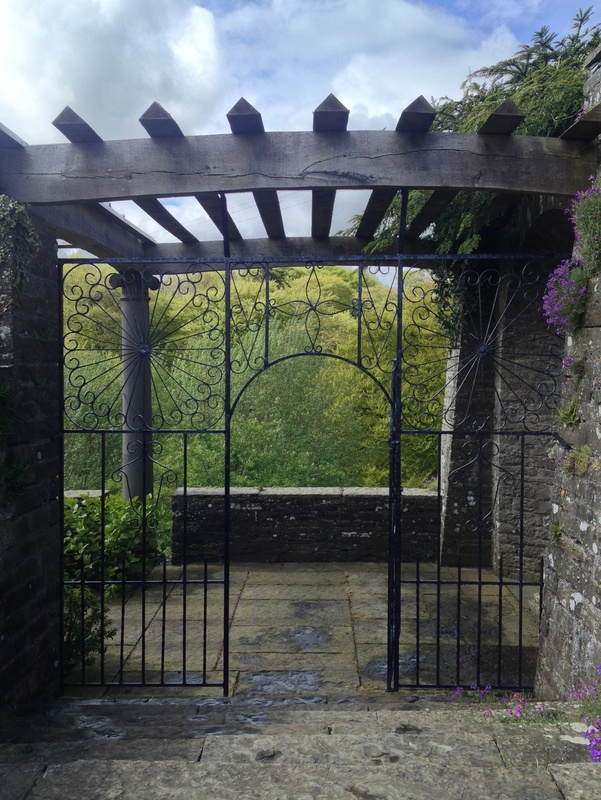 The columns can now be seen in a pergola walk which Lutyens constructed to the west of the main terrace and where they support a line of oak beams. This walk, from which there is a sharp descent to the lake, is otherwise composed of rough-hewn stone, with an open prospect at its southern end and an apsidal niche at the northern: the latter once held a copy of the Capitoline Venus but now contains a more respectably clothed figure. On an earlier occasion Lutyens had announced that the colonel’s ‘cross period has damaged the garden as there is, I think, evidence in my work of my attitude or despondency towards him.’ There is in fact no evidence of the sort apparent, particularly not in the marvellous elliptical sunken garden which is Lutyens’ greatest legacy at Heywood. 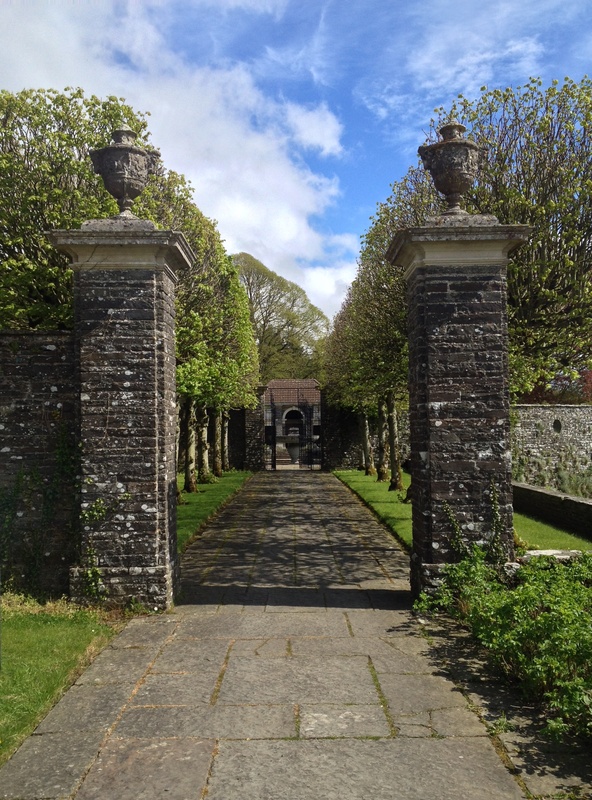 The approach to this was most likely intended to have been via a short sequence of yew enclosed spaces which lead to a curved flight of stone steps bringing the visitor right into the garden. 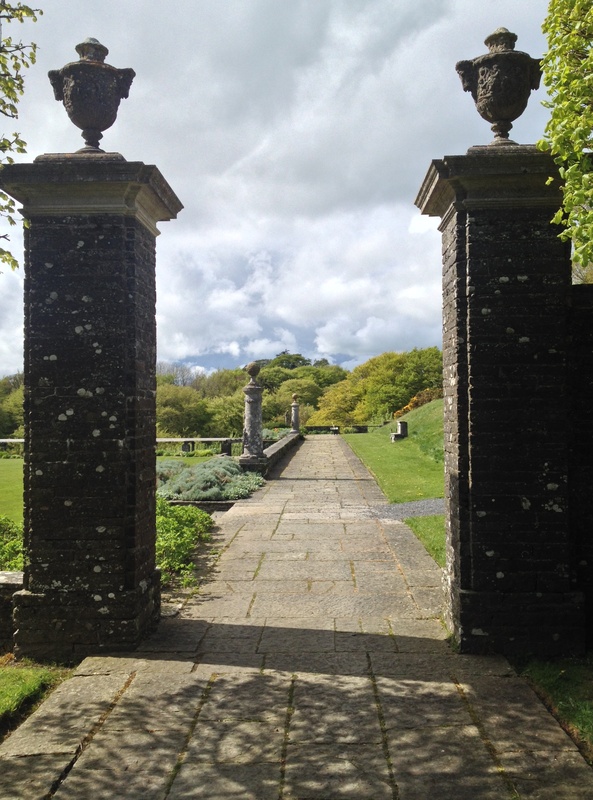 Today however, the more customary point of access is from the main terrace, passing tall piers to a pleached lime walk. Here a low stone wall to the south offers open views of the countryside, the wall to the north being higher and carrying a series of cut stone niches: originally these contained lead busts but they are now filled with stone urns. 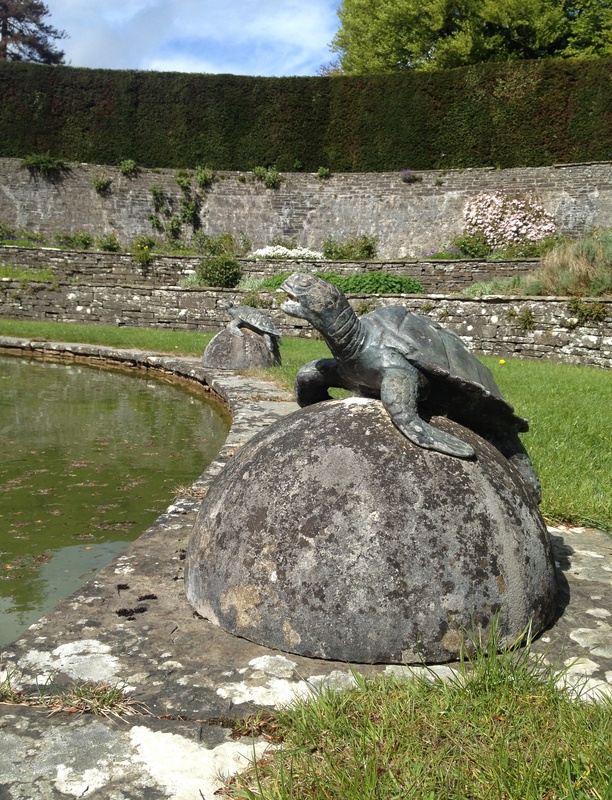 At the end of this walk, wrought iron gates provide access to the sunken garden, its centre occupied by a large pond once fed by spouting bronze tortoises and holding a basin formerly topped by another piece of sculpture. 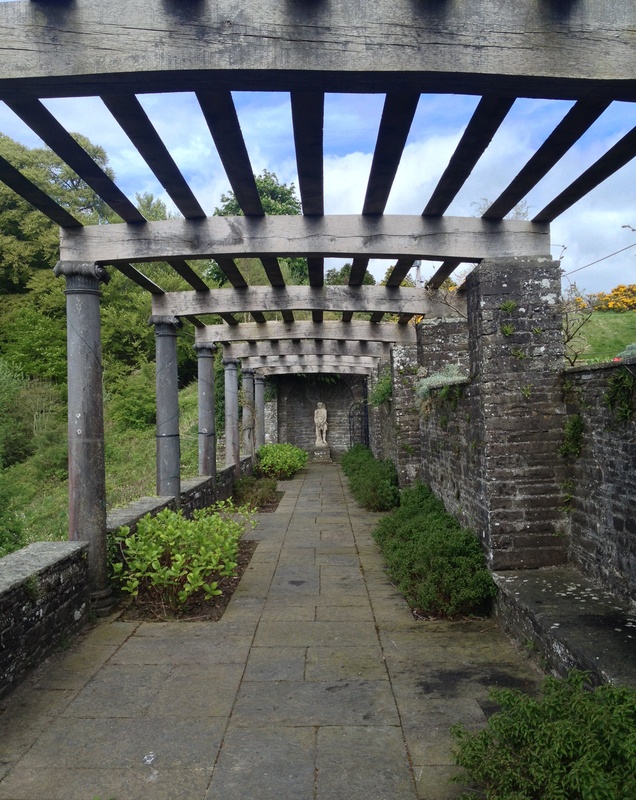 At the easternmost point of the sunken garden is a slender, single-room pavilion, the rear wall of which contains four Ionic capitals set into the rough stone and said to have come from the 18th century Irish House of Commons designed by Sir Edward Lovett Pearce (for more about this discovery, see Jane Meredith’s article on the subject in the Irish Arts Review Yearbook 2001, Vol. 17). 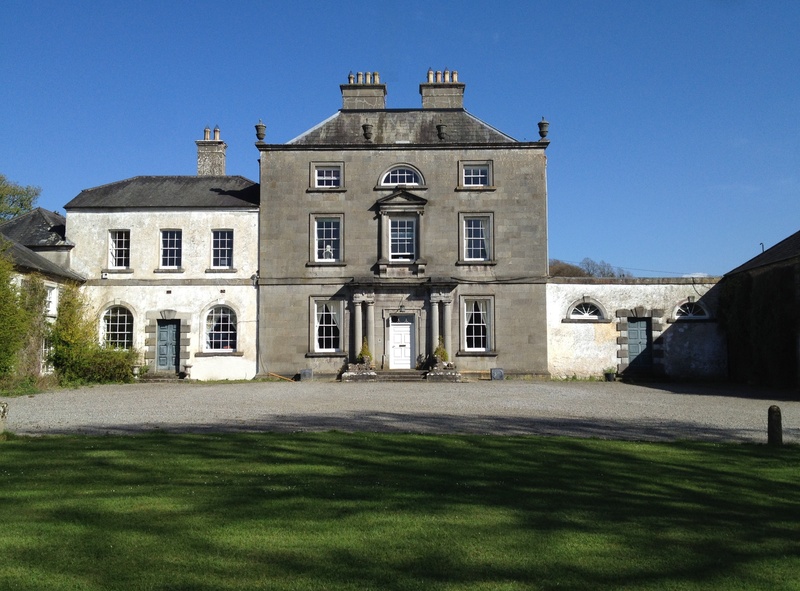 Like so many other Irish country houses and estates, Heywood experienced mixed fortunes in the last century. After its owner’s death in 1934, the house stood empty and then the Land Commission moved in to divide up the property. In 1941 the house and surrounding 160 acres was acquired by members of the Salesian religious order who originally used the place as a novitiate. Unfortunately in 1950 the house was badly damaged by fire, after which a decision was taken to demolish it; a new building was erected on a site to the north-east adjacent to the former stable yard. This became a school run by the Salesians but since 1990 has been a community school. Three years later the Lutyens gardens were transferred to state ownership and they have since been the responsibility of the Office of Public Works. Visiting Heywood today is a curious experience. 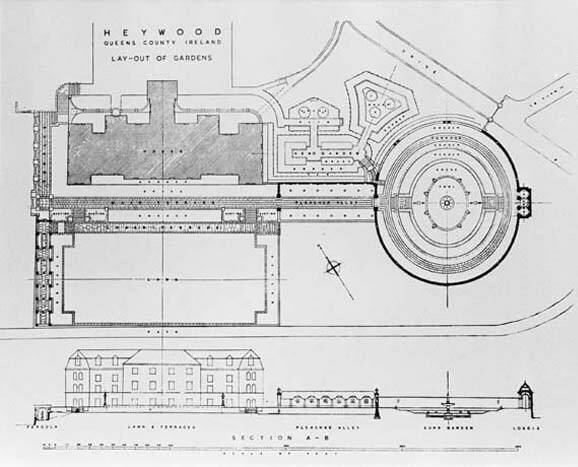 On the one hand, it is wonderful that Lutyens’ work here has been preserved, on the other it is difficult properly to appreciate his vision without the presence of the house for which the gardens were intended to provide a setting: the context for which they were created has gone (see the plan below for a better understanding of this). And the 18th century parkland devised by Michael Frederick Trench is even harder to envisage since it has received very little attention, and some of it has been altogether lost. The defiant ugliness of the school buildings also plays its part in suppressing any impulse towards romanticism. Conversely, once properly inside the gardens equivocation slips away, and the genius of Lutyens takes over. It is, as I say, a curious experience but with the accompaniment of a little imagination by no means an unpleasant one. With thanks to Máirtín D’Alton for his advice and information. This weekend sees the Irish Georgian Society’s annual Traditional Building Skills exhibition take place at the Hunt Museum in Limerick. 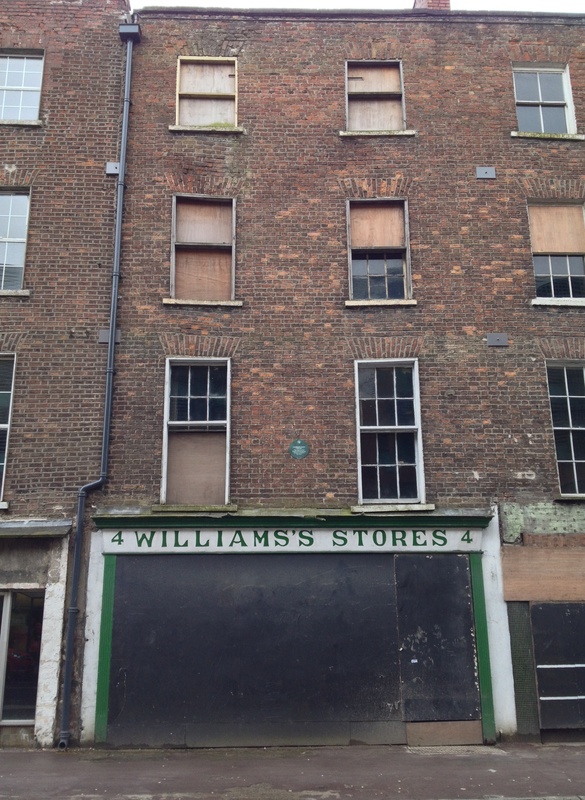 Visitors might care to look across the road to the current poor state of Patrick Street, including this house No.4, birthplace of the 19th century soprano Catherine Hayes. One of the most celebrated singers of her generation, she performed in opera houses throughout Europe (as well as giving a recital for Queen Victoria in Buckingham Palace in June 1849) before touring to the United States – where P.T. Barnum sponsored her concerts in California – Australia and India. She deserves to be better remembered today in her native city than the condition of this building and its neighbours would indicate.